A four-game series between the Washington Nationals (51-35, 27-19 awa) and the Miami Marlins (42-46, 23-24 home) will come to close tonight at Marlins Park in Miami, Florida, as the visiting Nationals make an attempt to take 3 out of 4 games from their National League East foes. With an intriguing pitching match-up between Washington’s Edwin Jackson (5-4, 3.73 ERA) and Miami’s veteran Carlos Zambrano (4-7, 4.20 ERA), this closing showdown should make a fine option for online sports betting at one of the top reviewed online sportsbooks found right here on our website. For the Washington Nationals, their impressive season continues to unfold behind a superb starting pitching rotation, which in this series so far has held the struggling Marlins’ bats to just 3 runs through three games played. Coming off last night’s combined 7-hit shutout for the Nationals’ ace Stephen Strasburg and his backing bullpen, Washington now is tied for the most road wins of any team in the Majors, and will look to secure win number 28 away from home if they can get another solid outing from Edwin Jackson. That goal may be in question though, considering the recent slump in form for Jackson, who has struggled in his last two starts, giving up 12 runs over just 8 2/3 innings of work against two relatively mediocre offenses (San Francisco and Colorado). With a 1-4 mark and a 5.33 ERA in 5 starts against the Marlins, some concern has to be present for Washington backers in this match-up, but with the Miami bats failing to produce any power and provide clutch hitting with runners on base, Jackson could be in line for a quality start on the road this evening. The struggles of the Marlins with Carlos Zambrano on the mound could be even more cause for concern tonight, as the wily veteran pitcher has seen his team lose six straight games in which he’s pitched over the course of the last month and a half. Interestingly enough, it seems as though Miami simply hasn’t been able to get that one clutch hit when Zambrano is pitching, as his last 4 starts have all resulted in 1-run losses for the Marlins. Since that has been the issue with Miami in this series as well, it’s safe to say that placing any wagers on Miami to win outright tonight should come with some serious reservations. That is especially true when considering Zambrano’s recent form, which finds him with an 0-4 record and an 8.00 ERA in his last 5 starts. What will make this match-up interesting however, is the fact that Zambrano has had plenty of success against Washington in the past, holding a 7-2 record with a 2.83 ERA against them in his last 9 starts against them, and is 1-1 this year with a 2.77 ERA in two starts this season. He won his last start against Washington at home back on May 28th, throwing 6 innings while giving up 3 runs in a 5-3 win for the Fish. It’s been evident that aside from more run support, Zambrano’s control is a key issue, as he’s allowed an absurd 21 walks in his last 5 starts. With a low-scoring series like this, and with Miami struggling to produce at the plate, Zambrano can ill-afford to put runners on base with a free pass, lest he wish to make history and earn a 7th straight defeat for the Marlins while he’s on the mound. In order for the hot-headed Zambrano to be effective, it’s essential that his supporting cast be on the ball at the plate, and jump on Edwin Jackson as early as possible. That points to the power section of the Marlins lineup, which has been non-existent in this series as Hanley Ramirez has gone 2-for-11, Emilio Bonaficio has hit 2-for-9, Logan Morrison has gone 1-for-8, and Omar Infante 1-for-11. The Miami order has struck out 30 times, and yesterday alone left 13 runners on in scoring position. It’s interesting to note here that Washington, despite being the best pitching team in the majors this season, has really not had much success at the plate, however they are clutch when they need to be and are often producing runs early in the game to give their starters a cushion to work with. Miami has to take that cushion out of play for Edwin Jackson, who hasn’t been as confident in his last few outings. Looking to the top players who could have a positive effect at the plate, Omar Infante is 7-for-13 against Jackson, and Carlos Lee is 4-for-10, but no matter who is hitting tonight, if there’s runners on base, the Marlins have to capitalize. 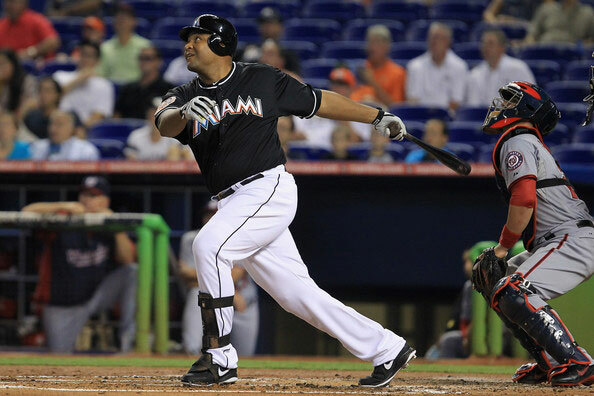 Otherwise Zambrano will find himself quickly frustrated once again, and that will give Washington all they need to squeeze out a few runs and take this series away from the home team Marlins. The Washington hitters haven’t really been too successful in this series either, as Bryce Harper is 1-for-12, Danny Espinoza is 2-for-11, and Michael Morse is 2-for-12, and against Zambrano most have not fared well either this year. However, again it’s the clutch hitting that comes into play especially with a struggling Miami batting order failing to do much damage, and a number of Nationals players could be in line for a breakout game in the final showdown between these two teams in this series. Adam LaRoche has the most experience against Zambrano, and while he’s struck out 12 times in 35 career at-bats against him, he’s also been on base 16 times in total, with 9 hits (3 doubles) and 7 walks. Ryan Zimmerman, despite his struggles against Zambrano during his career (5-for-26), could be in for a breakout game with a six-game hitting streak heading into tonight’s contest. Ian Desmond is another Nationals player worth keeping an eye on, as he’s 5-for-12 in this series, and has 3 multi-hit games in his last 4 starts. He’s hit safely in 9 out of his last 10 games, and is due against Zambrano going 0-for-6 against him so far in his short career. Desmond is on a tear in July so far, hitting .394 with 4 home runs and 9 RBIs, so look out for this kid to potentially figure into the scoring line tonight. Betting Lines for the Miami Marlins vs. Washington Nationals at Oddsmaker sportsbook. The lines are moving around quite a bit on this game today, with the Washington Nationals getting the nod as the slight favorite straight up on the money line at -109 odds to win behind starter Edwin Jackson. Though Carlos Zambrano has failed to produce a win for the Marlins in his last 6 starts, his strong record against Washington has Miami at just slight -101 underdogs. After getting swept by Miami in a 3-game series earlier this month, Washington has a good chance here to take 3 out of 4 from their NL East division rivals, and should be a good option for sports betting straight up at decent -109 odds. Against the spread, Washington is getting +1.5 runs at -220 price, while Miami is allowed -1.5 runs at +180 odds today. With Zambrano pitching, the Marlins have been within 1 run in his last 4 starts, and with neither team producing a lot of offense, this could possibly be another close match-up. It’s going to be very hard to take the Marlins to cover the spread here though, considering they’ve only average 1 run per game in the 3 previous contests during this series, but a breakout may occur against a struggling Edwin Jackson, who has not pitched well against the Marlins generally. Lastly, the total runs set for the over/under line stands at 8, which has not been reached in the previous 3 games of this series (Game 1 was 5-1, the highest run total thus far). There’s definitely potential for the over bet to be an interesting pick today, considering the recent struggles of both starting pitchers, however the lack of offense for both teams has to be a concern. The bookmakers however are leaning over with -120 odds for a break out, and EVEN money set for the runs total staying under. We’re figuring for the onus to be on the mound this evening, and for both pitchers to step up their form in a crucial Game 4, which should keep the runs below the O/U mark.